Celebrate each season of the year with seasonal soaps that reflect the unique variety, colors and scents of seasons year round. In the Fall we have Autumn Harvest Soap, Baked Apple Pie Soap, and Pumpkin Cream Goat Milk. 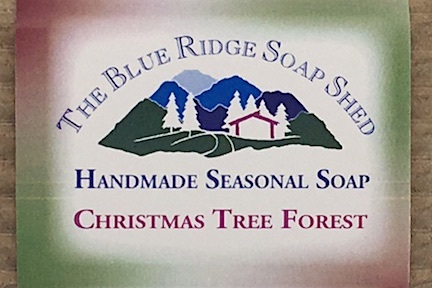 For the holiday season we offer Christmas Tree Forest Soap, Candy Cane, Cranberry Spice, Gingerbread Cream Goat Milk Soap, to name just a few! A delicious, cinnamon-y, just from the oven apple scented soap. A great hostess gift for holiday meals and parties you're invited to attend. Christmas Tree Forest soap is a balsam soap with little bits of our Spruce Pine needles. This goat milk soap blends the tart bite of cranberries and sweet, mild allure of Fig with just a touch of Orange and Pink Grapefruit. This brightly colored orange soap smells just like an Autumn produce stand filled with apples and fresh air! This Holiday classic is wonderful and spicy year round, rich and smooth because of the rich goat milk base we made it in! A bright and warm combination of orange, cloves and cinnamon in this regular four-oil recipe soap.